A simple, hands-on way for students to recreate the steps of organic biochemistry reactions, these large colorful manipulatives represent elements of carbohydrates, lipids, and amino acid synthesis. Sharon Spencer designed these laminated manipulatives to attach to each other with Velcro® for easy re-creation of macromolecules. Working cooperatively in groups, students use the hands on instructions for building and breaking down macromolecules to illustrate the digestion of the polymers by hydrolysis. 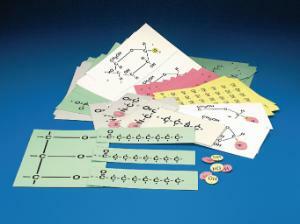 Includes five sets for 30 students and instructions. Partial assembly is required. Grades 10–12.